Definition at line 37 of file lldrawpooltree.h. Definition at line 41 of file lldrawpooltree.h. Definition at line 47 of file lldrawpooltree.cpp. Definition at line 65 of file lldrawpooltree.cpp. Definition at line 89 of file lldrawpooltree.cpp. Definition at line 287 of file lldrawpooltree.cpp. Definition at line 281 of file lldrawpooltree.cpp. Definition at line 292 of file lldrawpooltree.cpp. References gObjectSimpleProgram, LLShaderMgr::MATERIAL_COLOR, and LLGLSLShader::mAttribute. Definition at line 276 of file lldrawpooltree.cpp. Definition at line 48 of file lldrawpooltree.h. Definition at line 55 of file lldrawpooltree.cpp. Definition at line 60 of file lldrawpooltree.cpp. Definition at line 73 of file lldrawpooltree.cpp. 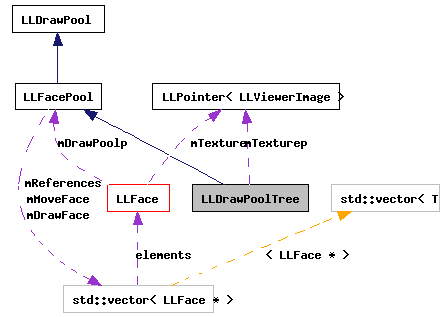 References LLPipeline::enableLightsDynamic(), f, LLFastTimer::FTM_RENDER_TREES, gPipeline, LLFacePool::mDrawFace, renderTree(), and t.
Definition at line 96 of file lldrawpooltree.cpp. References f, glBlendFunc, LLFacePool::mDrawFace, renderTree(), and TRUE. Definition at line 135 of file lldrawpooltree.cpp. References LLDrawPool::addIndicesDrawn(), LLViewerImage::bindTexture(), LLVOTree::drawBranchPipeline(), f, face, LLPointer< Type >::get(), LLQuaternion::getAngleAxis(), LLViewerObject::getAppAngle(), LLViewerObject::getPositionAgent(), LLXform::getRotation(), LLXform::getScale(), LLDrawable::getVObj(), glPopMatrix, glRotatef, glTranslatef, LLDrawable::isDead(), j, LLVector3::magVec(), LLVOTree::mBranches, LLVOTree::mDepth, LLFacePool::mDrawFace, LLVOTree::mDroop, LLViewerObject::mGLName, mTexturep, LLVOTree::mTrunkBend, LLVOTree::mTrunkDepth, LLVOTree::mTwist, LLVector3::mV, RAD_TO_DEG, S32, sDiffTex, LLVOTree::sLODAngles, LLVOTree::sTreeFactor, TRUE, VERTEX_DATA_MASK, VX, VY, VZ, x, y, and z. Definition at line 263 of file lldrawpooltree.cpp. Definition at line 39 of file lldrawpooltree.h. Referenced by getDebugTexture(), getTexture(), instancePool(), LLDrawPoolTree(), and renderTree(). Definition at line 66 of file lldrawpooltree.h.